When it comes to spectacularly embarrassing Wheel of Fortune contestant fails, nothing will ever top the "A STREETCAR NAKED DESIRE" screw-up last month. A contestant on a recent episode of the game show, however, came pretty damn close, with a guess so spectacularly wrong that it's almost worthy of praise. On Tuesday night's episode, the show's contestants were asked to quickly solve a puzzle based on the category "living thing." 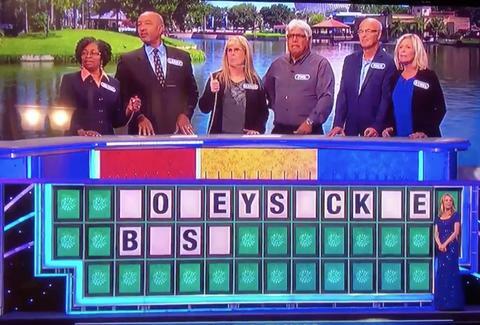 Several seconds passed without any answers, but after the letters "_O_EYS_CK_E B_S_" were added to the board as clues, it looked like one contestant had finally cracked it when she buzzed in to solve. Except her solution to the puzzle was so, so wrong that you'll have to watch it at least twice to full appreciate it. That's right, folks: the contestant guessed "popsicle bike." This, despite the fact that -- and this is only the most obvious of the many clues -- there was an "s" in the second word, "B_S_," where the "k" would be. Host Pat Sajak, who probably mastered stifling laugher on the show decades ago, responded with just "No..."
In case you're wondering, the correct answer was "honeysuckle bush." As for a "popsicle bike," we've never heard of such a thing, but it sounds kind of messy. One thing is certain, though, a popsicle bike is definitely not a "living thing." Tony Merevick is Cities News Editor at Thrillist and would have probably guessed something similarly wrong. Send news tips to news@thrillist.com and follow him on Twitter @tonymerevick.